I'm finally starting to work on the Strategic Winter Squash Reserve in the cold corner of my breakfast nook (down to 50 degrees Fahrenheit during the recent Polar Vortex). This is where I stash the more shelf stable of the Community Supported Agriculture (CSA) farm share vegetables during my weekly Vegetable Triage, and I appreciate how a cool, dark place can store fresh local vegetables for me to enjoy when I've run out of fresh greens and the more perishable farm share produce. I've had some winter squash last as long as 3-4 months, but I prefer not to play fast and loose with my SWSR. The vegetables I've canned (tomatoes, tomatillos, tomato salsa, tomato sauce, salsa verde, green tomatoes, tomato jam . . . did I mention I canned a whole bunch of tomatoes?) and frozen (corn, carrots, leeks, zucchini, yellow squash, roasted peppers, Hatch chiles, celery, . . . and I am sure something else) will stay in good condition longer than the winter squash, so winter squash is next on the chopping block. Literally! 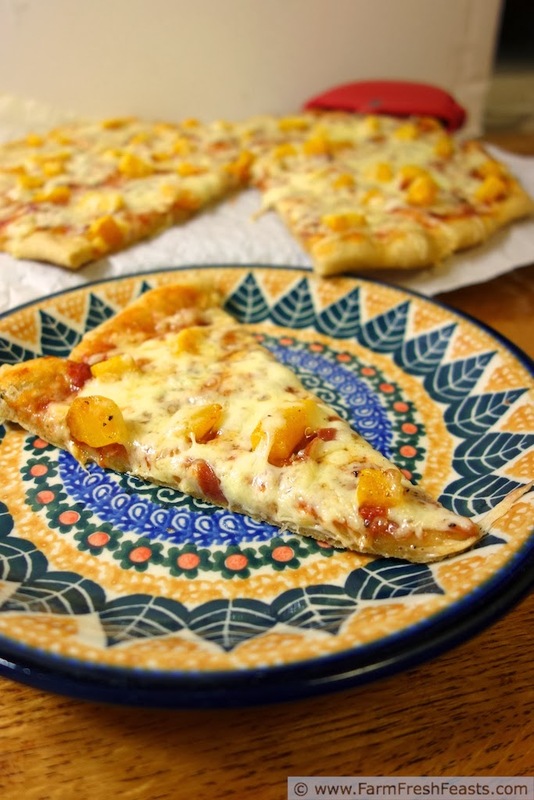 This pizza is a subtle way of including winter squash into our meals, and though my kids picked the squash off their slices, my spouse and I enjoyed it. 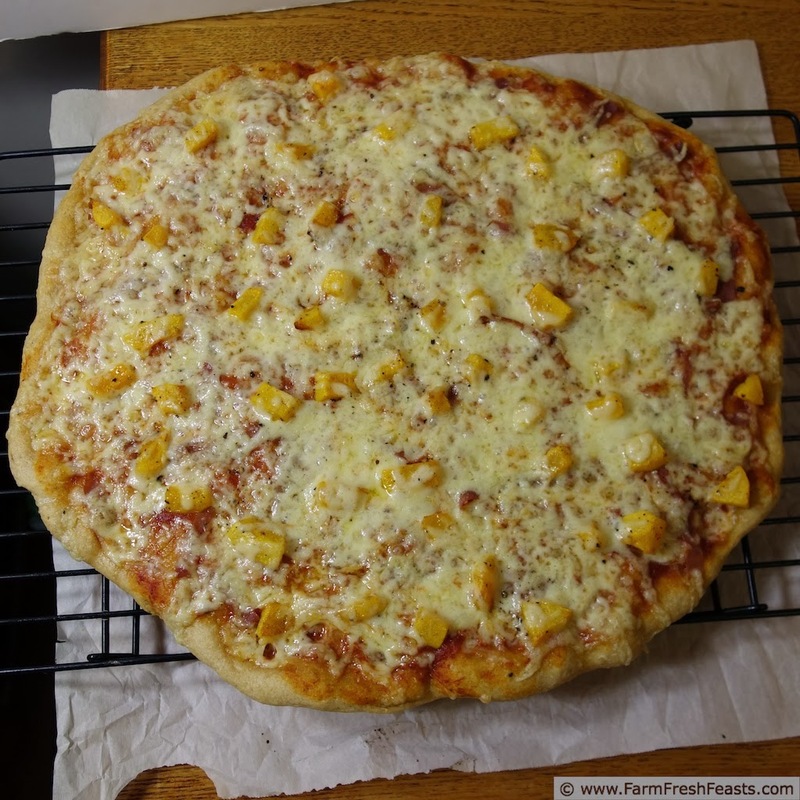 [In fact, instead of saving the extra roasted squash that didn't make it onto the pizza, I stood over the stove with a fork and snarfed up squash while chatting with my spouse.] Yum! There's something about roasting that brings out the sweetness of vegetables--be they mushrooms or squash or potatoes. Coming up in the next few weeks I've got roasted squash in hummus and roasted sweet potatoes in salsa . . . but for today, because my family likes our Friday Night Pizza Nights, please enjoy a pizza! For other ideas on how to use butternut squash, please see my Butternut/Buttercup Squash Recipes Collection and my Winter Squash Recipe Collection, part of the Visual Recipe Index by Ingredient. For other pizza ideas please see my Friday Night Pizza Night board in Pinterest, and my Visual Pizza Recipe Index. For how to Use This Blog, please click here. Preheat oven to 400 degrees Fahrenheit (if you've got a pizza stone, place it in the oven now, or just leave it in all the time like I do). Toss the squash cubes with oil, season with salt and pepper, and spread on a rimmed baking sheet. Frugal tip: if you line the baking sheet with a piece of parchment paper, you can use that same parchment for your pizza. Bake the squash for 20 minutes or until soft and tender, then remove from the oven and increase the oven temperature to 450 degrees Fahrenheit. On a brand new oiled piece of parchment paper, or the slightly squashy one from the rimmed baking sheet, stretch out your pizza dough into the shape that pleases you. Bonus points for a successful butternut squash shape. Spread prepared sauce over the dough. Top with prosciutto and squash, then cover with cheese. Shake pasta sprinkle over top of cheese. Bake for 5-8 minutes, then shimmy the parchment out from underneath the crust and bake directly on the stone (or cookie sheet) another 3-5 minutes or until cheese is bubbly and browned. Cool a few minutes on a rack, then slice (Amazon affiliate link to my favorite slicer, shown above) and serve. This post is shared on the From the Farm Blog Hop, Clever Chicks Blog Hop, Tasty Tuesdays, Fresh Foods Wednesday, What's Cookin' Wednesday. Why not indeed--prosciutto, or bacon, can make everything better! I'm so impressed by how you've saved up the goodies of summer to enjoy now. Someday I'll get to canning. 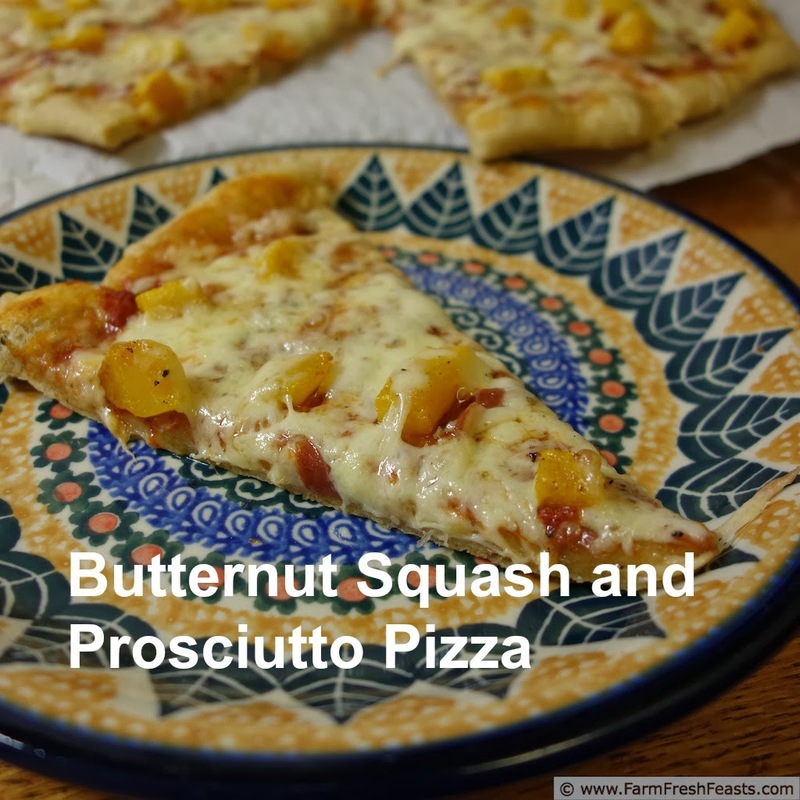 This pizza sounds so yummy, I'm always looking for more ways to eat squash! This past season was the first time I really branched out with canning, all thanks to Marisa's Food In Jars book. And having tomato jam on a ham sandwich--holy cow, that's a delicious combination! Salty ham and slightly sweet jam--a match made in heaven. There is something quite intoxicating about the combination of butternut squash and proscuitto. Sweet and salty combine on a bed of cheese. Man I really need to get over this whole meat thing. I broke into my SWSR this weekend, and I roasted up three Acorn Squash. I pulverized the insides, making a lovely puree and now I'm going to.....well I haven't figured out what I'm going to make with my puree. 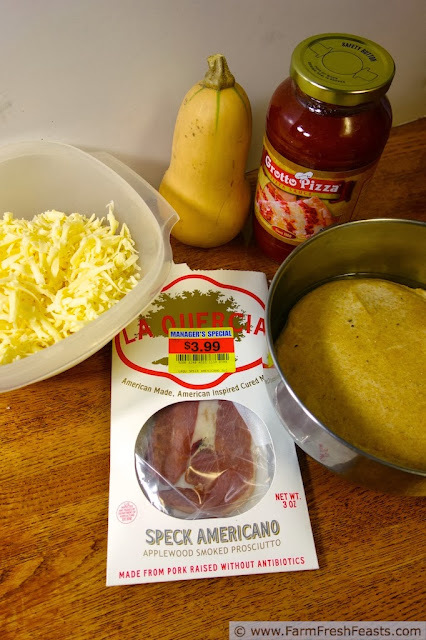 I've done muffins a bazillion times (slight exaggeration) so I'm thinking I need to finally get on the pizza crust train and maybe incorporate my squash puree. I suspect you've got some instructions which will help me make the perfect pizza pie crust. Yes, I do have the ideas to incorporate squash in your pizza crust in my Visual Pizza Recipe Index--but you've got the Mad Kitchen Skillz to take it in and Acorn Squash direction and I look forward to seeing what you've done! They do make a great pair, don't they? Please let me know how your pizza turns out. This looks amazing! We will be featuring this on Tasty Tuesday at Craft Dictator so come on over tomorrow and check it out at http://www.craftdictator.com!